Dozens of schools across the Chicago area are leasing their property to telecom companies to erect cellular towers and antennas on school buildings and grounds, NBC5 Investigates has discovered. Until now, radiation from cell towers has not been considered a risk to children, but a recent study raises new questions about possible long-term, harmful effects. Terrence Fagan says he will never forget the day he walked his son into kindergarten for the first time at Sutherland Elementary. “I looked up and I saw these two towers that I’d never seen before,” he said. The towers in question were cell phone antennas, mounted on the building’s smokestack. Fagan says he immediately started doing research, hoping that he would find that scientists had conclusively proven that phone towers pose no risk. Fagan quickly learned that he was not alone with his concerns. Parents from Sutherland and a second school in the Beverly neighborhood, Mount Greenwood, had mounted a petition asking for answers about potential risks from the phone towers. NBC5 Investigates filed Freedom of Information Act requests with 409 public school districts across the Chicago area, and found that 139 local schools rent space on their grounds, buildings and smokestacks for cellular antennas. Over 90 of those are Chicago Public Schools – most of them elementary-level -- where kids may attend for as many as nine years. CPS reaps about $5 million in rental fees from those towers every year. Both the American Cancer Society and the Federal Communications Commission have stated that so-called RF radiation from cell towers does not pose a risk to people on the ground, because the transmissions are line-of-sight from the antennas, which are traditionally mounted high in the air. But NBC5 Investigates spotted many antennas mounted far lower, close to the roof line and even the windows of some CPS buildings. Fagan questions what scientists know about living in even lower levels of RF, below the towers, for long periods of time. The Beverly parents were especially alarmed by news of a recent study from the National Toxicology Program, which seemed to show a direct link between cell phone RF and cancer. Fagan said no parent would allow a Starbucks to be located in the school offering free coffee, if it would mean constant exposure to caffeine. It turns out the National Toxicology Study was done in Chicago at the Illinois Institute of Technology. And its findings were reported worldwide. During the study some 3,000 rats and mice were continuously exposed to high levels of RF for two years. McCormick says about 8 percent of the animals developed brain tumors and other complications. And the concerns of the Chicago parents? That said, McCormick said his research would seem to indicate that the location of the antenna should be given careful consideration, noting that RF radiation drops off dramatically the further one gets from the tower. The Beverly parents are hardly alone in their concerns. School systems ranging from south-suburban Tinley Park and west-suburban Naperville, to the entire Los Angeles Unified School District, have said no to cell towers because of similar worries over long term exposure to RF. And the International Association of Fire Fighters has long opposed the mounting of cell antennas and towers at its members’ fire stations, citing similar concerns about low-intensity RF radiation. 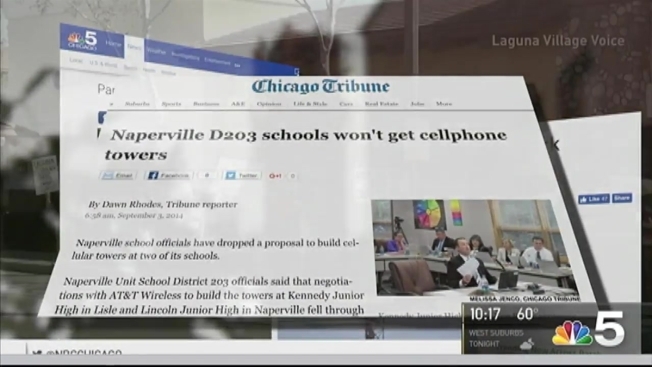 When NBC5 asked why CPS was not willing to have a more thorough discussion about the issue of cell towers at its schools, on-camera, the CPS spokesman repeatedly refused to comment. NBC5 Investigates has compiled both a list and an interactive map, showing all of the schools that we found, throughout Chicago and the suburbs, that have cellular antennas on their property. Click here to see if your child’s school made the list.